The fact that neither of her parents wants to deal with her is nothing new to Penny. She’s used to being discussed like a problem, a problem her mother has finally passed on to her father. What she hasn’t gotten used to is her stepmother…especially when she finds out that she’ll have to spend the summer with April in the remote woods of Washington to restore a broken-down old house. Set deep in a dense forest, the old Carver House is filled with abandoned antique furniture, rich architectural details, and its own chilling past. The only respite Penny can find away from April’s renovations is in Miller, the young guy who runs the local general store. He’s her only chance at a normal, and enjoyable, summer. But Miller has his own connection to the Carver House, and it’s one that goes beyond the mysterious tapping Penny hears at her window, the handprints she finds smudging the glass panes, and the visions of children who beckon Penny to follow them into the dark woods. Miller’s past just might threaten to become the terror of Penny’s future…. I liked The Bargaining for the most part. The idea was a great one, but I don't feel like it was expounded on enough during the story, and when the final reveal came, it was a bit of a letdown. Not because it wasn't a great idea, but because it was never really explained in a way that made sense. However, despite these issues, I did like the story. The characters were very well written. Not exactly loveable, with the exception of April and Rob, but very well done, characterization wise. Penny grew exponentially throughout the story, and it was a great thing to experience. And the house was a creepy one. The horror factor, ah the major issue and what kept this from being 4 stars.... The house was creepy, and there were moments, like the swing and the shed especially that got me, but I wanted to be SCARED. I don't blame that on the author, for the most part, because it takes a lot! 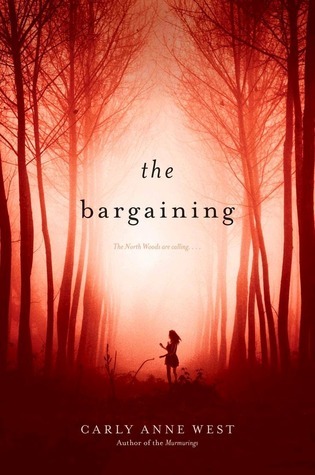 All in all, The Bargaining was a good read, with a great cover, that I am happy I got to experience. I would absolutely recommend this to people who like creepy without being scared, or those just getting into the horror genre! Thanks to Edelweiss for allowing me access to this review copy!